Pujolasus, E.; Betró, S.; Segui, X.; Àgueda, Alba; Casal, J.; Ocampo-Duque, W.; Rudolph, I.; Barra, R.; Páez, M.; Barón, E.; Santín, G.; Eljarrat, E.; Barceló Cullerés, Damià; Darbra, R.M. Brominated flame retardants (BFR) are pollutants that represent a threat to both human health and environment due to their industrial use, their persistence and their ability to bioaccumulate and biomagnify in food chains, especially in the aquatic one. 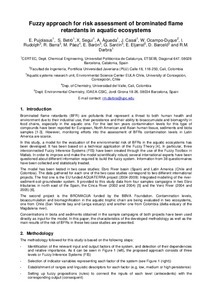 For the last ten years contamination levels for this type of compounds have been reported for European, North American and Asian human tissue, sediments and biota samples [1-3]. However, monitoring efforts into the assessment of BFRs contamination levels in Latin America are scarce. In this study, a model for the evaluation of the environmental risk of BFRs in the aquatic ecosystems has been developed. It has been based on a technical application of the Fuzzy Theory . In particular, three interconnected Fuzzy Inference Systems (FIS) have been created through the use of the Fuzzy Toolbox in Matlab. In order to improve and make the model scientifically robust, several international experts have been questioned about different information required to build the fuzzy system. Information from 38 questionnaires have been collected and statistically treated. Pujolasus, E. [et al.]. Fuzzy approach for risk assessment of brominated flame retardants in aquatic ecosystems. A: SETAC Europe Annual Meeting. "6th SETAC World Congress 2012. SETAC Europe 22nd Annual Meeting". Berlin: 2012.